After visiting the Stourbridge Town branch, I got on the 13.34 from Stourbridge Town all the way to Shirley. I was going to get off at Tyseley and take some photos of the station, but my train didn't actually stop there. So went as far as Shirley where my train terminated and then waited for the next one through to Stratford. Starting at Tyseley, where there are carriage sidings, housing Chiltern and West Midlands units, and the headquarters of the Birmingham Railway Museum Trust. The station is a four platform, two-island station, and like the previous Selly Oak station, is immaculate. All four platforms are painted in Great Western railway colours and are graffiti free. Three lines go off to the left and Leamington Spa, whilst we go off to the right on double track and into a cutting. The line is not welded here, so it is a bit clackety clack, before we stop at Spa Road. It has two stainless steel shelters; both free of graffiti and is still in the cutting. We then go into a short tunnel and then another cutting, before seeing houses on both sides of the line. We pass some derelict land on the left before stopping at Hall Green station. This is again painted in the Great Western livery of chocolate and brown. There is a small glass shelter on the left and the original red brick station building on the right. We go into another cutting for about a mile and then onto an embankment, with views of suburban Birmingham, full of semis and detached houses. We go into another cutting and then slow for Yardley Wood station. It has a perspex shelter and a red brick shelter on the left side, and the original red brick station building on the right, which looks like it isn't used for anything. It still has the same light brown colour scheme. We pass modern housing on the right and then go onto an embankment and then see older detached houses on the left. We continue on the embankment and on unwelded rails, as we pass rows of semi-detached houses on both sides. We pass a builder's yard on the left and then come into Shirley station, which has a lovely signal box on its left hand platform. There are original red brick station buildings on both platforms, which are kept in good order, as well as a ticket office that is actually open. I pop out to the shops across the road and buy some food and then go back to wait for the 14.45, which is on time. From now on it's semaphore signals and an hourly service to Stratford-upon-Avon. There are lots of trees on the left and then we go over a canal and then leave Birmingham behind as we go into the countryside. We pass through Whitlock's End station, which has a glass shelter on the right hand platform. The land is quite flat now as we pass rough pastureland. Then we come to a stop at Wythall, which has awful coloured mustard brick shelters on both platforms, but up by the road bridge is a more charming wooden clad ticket office. We go straight out into the countryside again and onto an embankment. It is starting to get more hilly now and the track starts to climb as it curves to the left. We pass through Earlswood with a conventional blue-framed perspex shelter on the right platform. Quite a few people are waiting on the opposite platform. We then go back out into the countryside again and onto unwelded rail. We then come into The Lakes station, which has a glass shelter on the right platform. There is countryside once again and we go under the M42 doing about 50 mph. Then it's a stop at Wood End station, which is quite an isolated station. It has its original black and white station sign, as well as the usual mustard coloured brick shelters. As we leave, we see sheep on both sides and it's now quite hilly. The track is welded again and you notice how smoother it is. We are on an embankment again and you can see the occasional farm in the distance, as the track snakes through the countryside. Danzey is another isolated country station with its mustard coloured shelters and its black and white station sign. We go over a river and back onto unwelded track again, before going into a cutting. We start to climb again now. The fields on the right are full of buttercups and look very yellow, whilst on the left are fields with sheep in them. There are signs of track maintenance here with square pipes piled up by the trackside. We pass through another cutting and then come into Hampton-in-Arden station. There is a signal box and some sidings on the right, followed by an island platform. On the left hand platform the original station house is still there, painted in chocolate and brown, though the windows are boarded up with red panels. There is a newish looking perspex shelter on the island platform, as well as two original black and white station signs and some plants making it an attractive looking station. There are a few large houses to be seen next to the station, but it is not a large place. We go into a cutting and the track becomes welded again. We pass allotments on the left and then come into Wootton Wawen station. It has two nice blue painted brick shelters, though no houses are to be seen here. There are lots of sheep in fields on both sides now as we reach 50 mph. We then slow down as we come to a red signal. Then a 3-car class 150 unit passes us in the other direction and the line from Leamington Spa joins from the left at Bearley Junction. We stop completely, as the guard rushes past to see what's up. We soon start up again. It's fairly flat now and we pass through Wilmcote station, (for Mary Arden's House). It's a nice station, well preserved, with the original station building on the right. It gets hilly again as we go into a cutting and then under the A46. We then start to slow as houses and offices appear line side. We go past industrial units on both sides and past housing developments on the left. We pass a Chiltern Clubman unit on the right and then finally we come into Stratford-upon-Avon station. It doesn't look like a terminus though, as the track continues round the bend to the buffers. Originally the line continued all the way to Cheltenham. 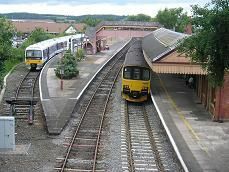 It has three platforms, two of them on an island, with GWR chocolate and brown livery and the original wooden/cast iron bridge. There are also flowers in hanging baskets on the platforms adding to its beauty.